Named after Warped founder Kyle Gellis's father, Don Reynaldo Coronas De Luxe is a limited edition release by Warped that comes in a single 5 1/2 x 42 vitola. Quite the personal line for Gellis, Don Reynaldo pays homage to the man that taught Kyle the basic principles of cigar construction, flavors, and lighting and smoking techniques, and the Warped founder attributes his passion and lover for cigars to his father, making this line all the more celebratory. Fashioned in the Miami-based, El Titan de Bronze factory, Don Reynaldo cigars feature a Corojo wrapper from the Dominican Republic inside which lies a Nicaraguan binder and fillers from both the Dominican Republic and Nicaragua. A stunning stick from construction and appearance to draw and flavor, Warped's Don Reynaldo Coronas De Luxe showcase notes of wood, pepper, and sweetness for a perfectly balanced, flavorful smoke. 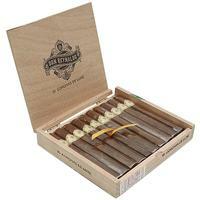 5% Off Five Sticks: $14.72 ea. 10% off box (10): $13.95 ea.